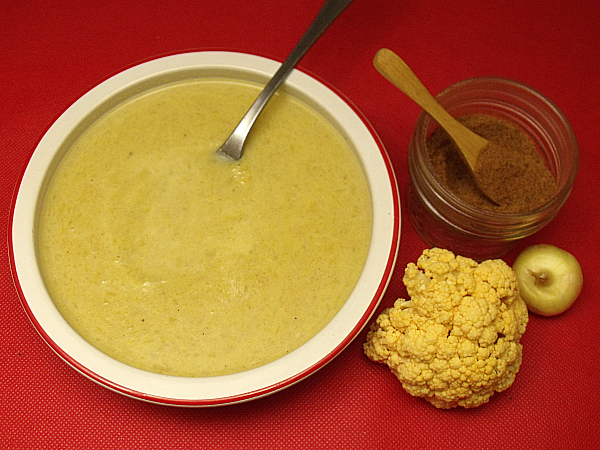 Mmmm… cauliflower! I have been using this wonderful vegetable more and more. Standard white cauliflower is good, but I like it even more when I can find colorful orange, green or purple cauliflower. 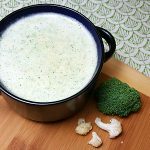 I get excited I find cauliflower soup on the menu when I’m out to eat, but usually when I ask if it’s vegetarian I find out that it’s made with chicken stock. Most of the recipes I’ve found also call for chicken stock. 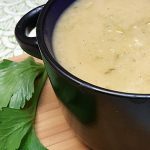 Naturally, I took this as a challenge and created a recipe that is vegetarian and can also be made as a dairy-free vegan soup. 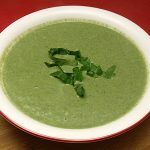 The soup is simple to make and the recipe can be easily doubled or tripled, if you are feeding a crowd. 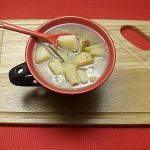 Combine butter, onion and garlic in a stockpot. Saute on high for a few minutes. 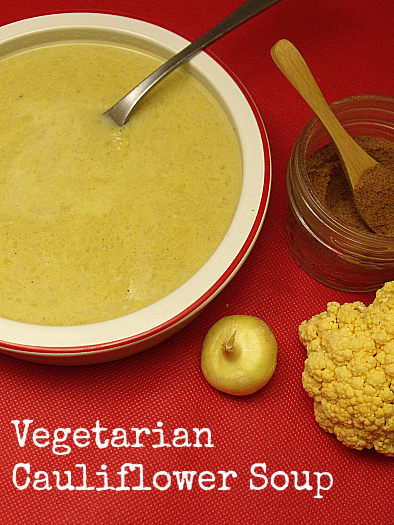 Add cauliflower, vegetable stock and salt. Bring to a boil and then simmer until cauliflower is tender (approx. 15-20 minutes). Add nutmeg and blend with an immersion blender. I like leaving a little bit of texture in mine, but you can blend it until completely creamy if you prefer.